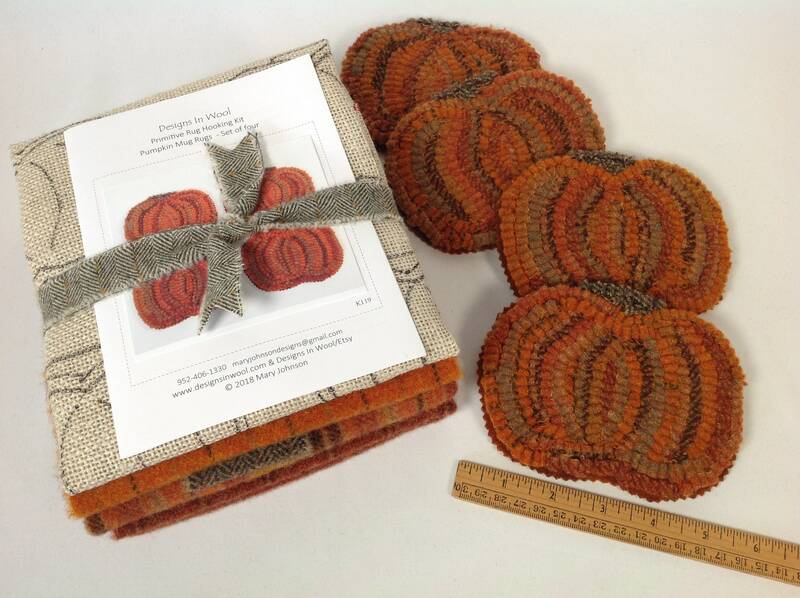 This listing is for the rug hooking KIT to hook my "Pumpkin Mug Rugs". 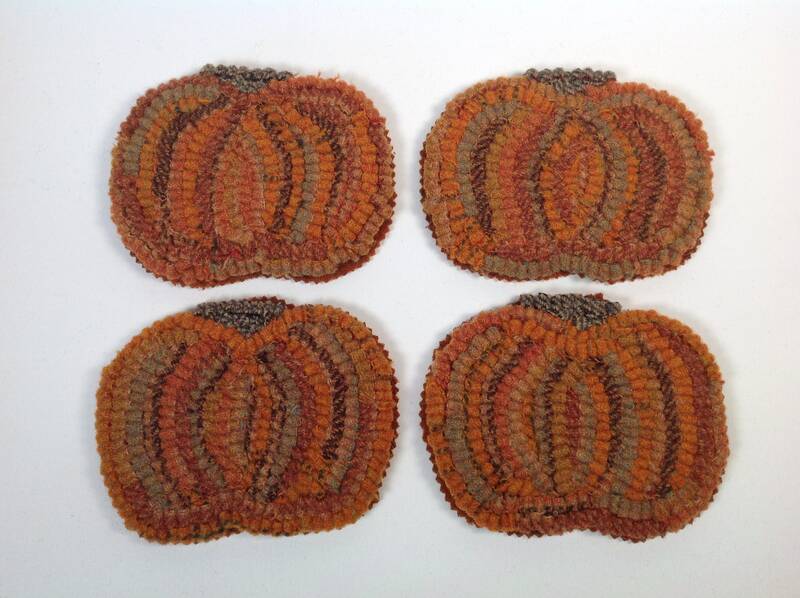 The four pumpkins measure approximately 5-1/4" x 4-1/4" each and are hand drawn on the backing fabric with 4" inch borders to make it fit on most rug hooking frames. The outside raw edges of the backing fabric have been serged to prevent raveling while hooking. 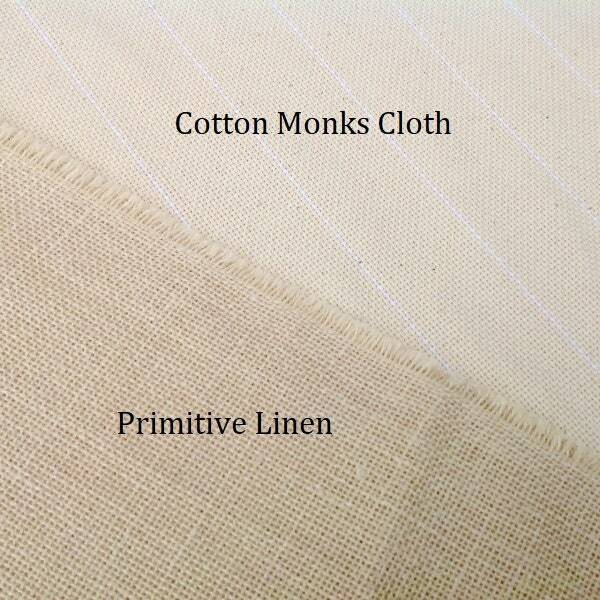 Select your choice of cotton monks cloth or primitive linen for a backing fabric and if you would like your wool cut in #8 (1/4" wide) strips. 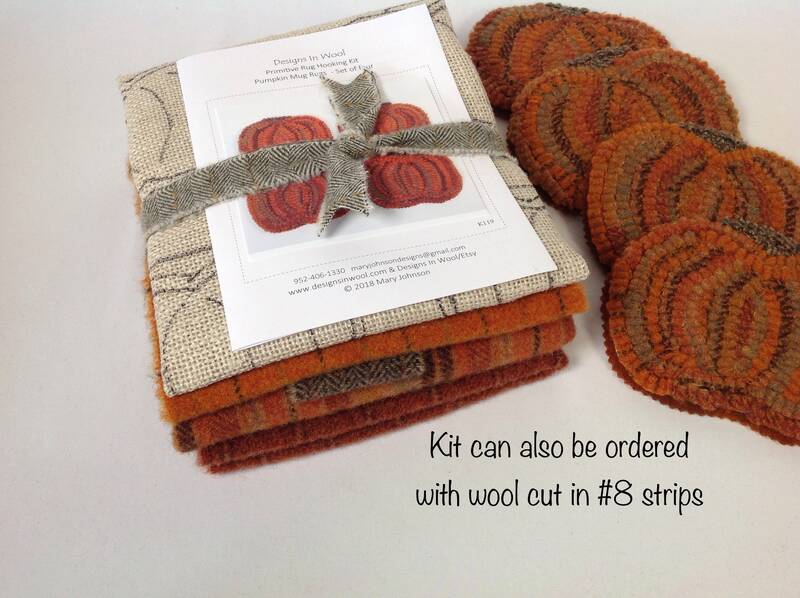 You also have the choice of ordering JUST the WOOL PACK in the event that you might have ordered the pattern earlier. 1) Hand Drawn Pattern on your choice of monks cloth or primitive linen with a color photo. 2) Wool Pack for hooking the mug rugs with either uncut wool or cut in #8 strips. 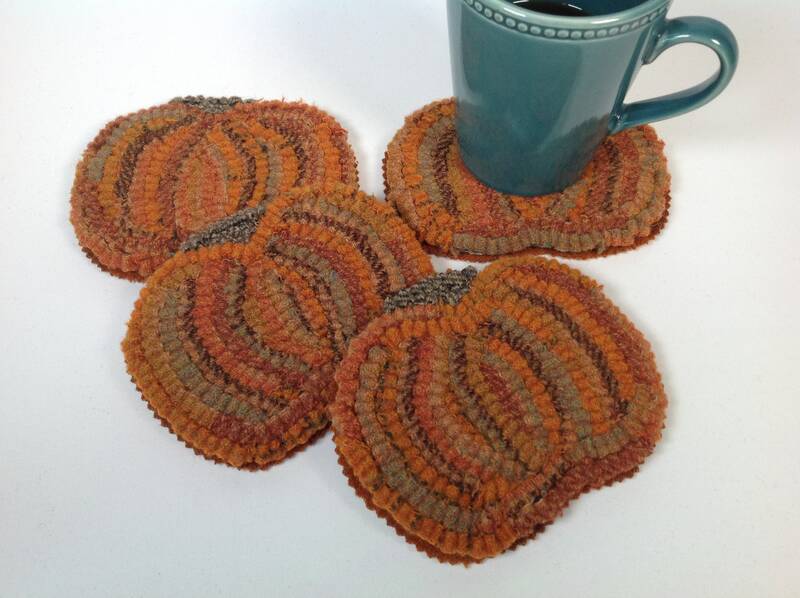 3) Wool Piece to finish the back of mug rugs. If you order the wool pack only, it will come uncut or uncut. If you order the wool cut, the wool piece to finish the backs will not be cut unless you specifically write me a note that you want that cut as well. 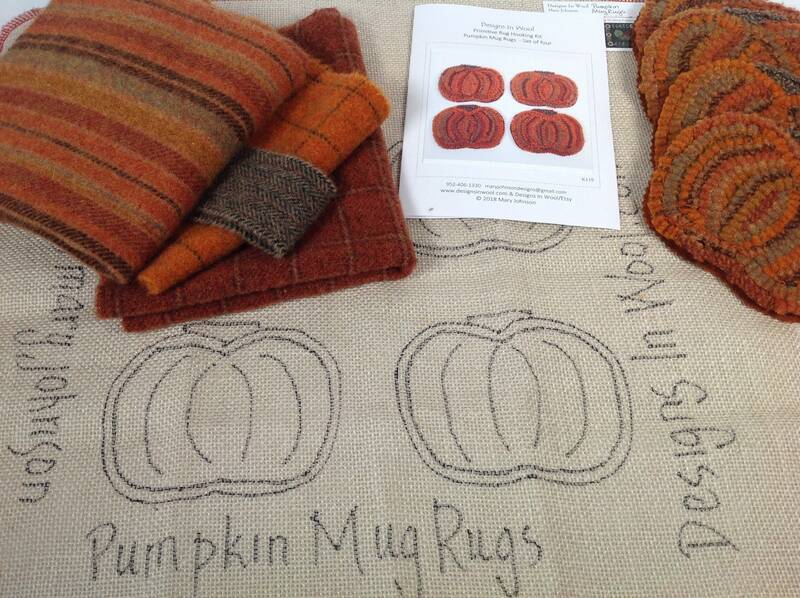 Wool fabrics may vary slightly from time to time from photo but will be in the same color range. Current wools are those included in the photo. Amount of wool in kit and the wool pack is based on how much I used to hook these four mug rugs plus extra. If you hook higher or tighter than I do, or with a different cut than #8, you may need extra wool and are welcome to purchase more. This kit does not include a hook or instructions on how to hook. There are many great sites that can help you with instructions on how to hook. This pattern is such a fun small project that hooks up quickly. It would make an ideal hostess gift. Have a stack ready for holding that cup of coffee, tea or cocoa. 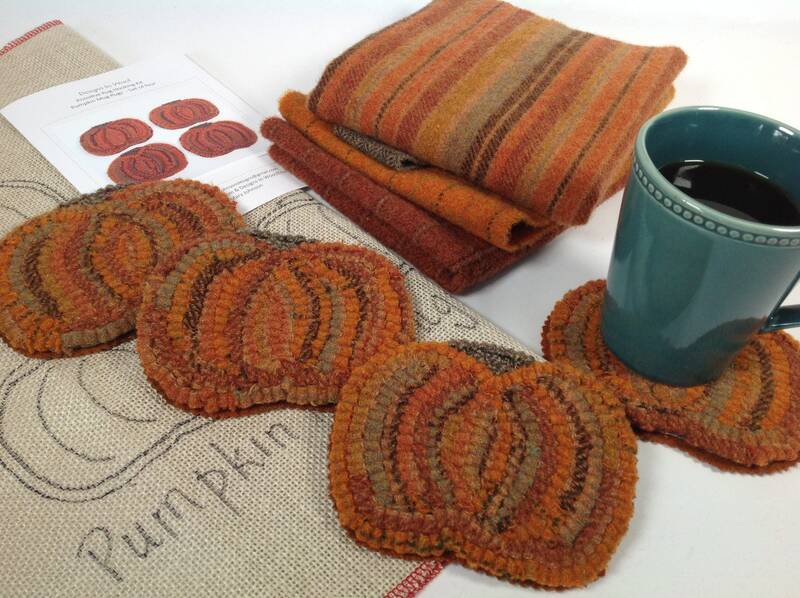 Hook them up in time for Fall, Halloween and thanksgiving. © 2018 Mary Johnson. This design/pattern may not be duplicated. Purchasing this pattern give you permission for one time use. Thank you for respecting copyright laws and supporting my small business. Thank you!!! Excellent product and smooth transaction.